road trip up to Idaho, September 2009. Last week, we said good-bye to our sweet Bodie girl. She was 14; an incredible age for a large dog, and our longest-lasting yet. The above photo is probably my favorite one of her that I have, because just looking at it, you can tell the kind of dog she was: sweet, kind, cheerful, enthusiastic, bright-eyed. Bonded with all of us as a superb family dog. For the first time since I was 2 years old, I’m without a dog. It’s a very strange feeling. I keep looking around for her, waiting for her to appear for her various daily routines. I am so fortunate to have had such a special dog in my life. She is loved and very much missed. Thank you. She was the sweetest dog I've owned. 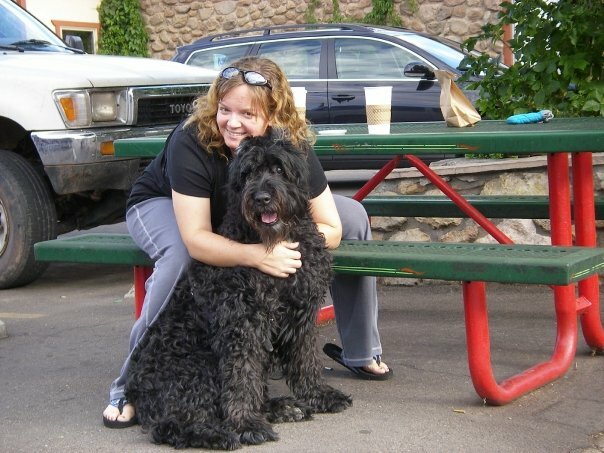 She was a purebred Bouvier, but looked very much like a giant schnauzer. Even had more of the schnauzer energy and enthusiasm. Thanks, Liz. I know very much that when the time is right, there will be another special one out there…it's happened that way every time, and every new one has something about them that reminds me of the previous one. Ashley, I'm so sorry for your loss. It is so hard to say goodbye to our furry friends. I've had to deal with it too many times. But the memories are always there to comfort you. She looks like a sweet dog.